Rainbow Rock Condos have an unsurpassed view of the ocean, fishing boats, waves crashing against rocks, and a long sandy beach. A floral-lined trail to the beach starts right outside the front door. When you see the beautiful multicolored rock cliffs above the soft sand beach, you understand where the name Rainbow came from. You can ocean kayak right from the beach and also try your hand at surfing in the waves when the surf is up. The tidepools filled with life are scattered throughout the rocks at low tide. To the North of the condo grounds is Boardman State Park and the trails extend for more than 20 miles along the coast with parking areas along Highway 101. Whales and Sea lions can be spotted from the trails and lots of different mushrooms and plants to see. Fishing is one of the best pastimes of the area and Brookings is know as the place where the biggest salmon are caught. Brookings harbor has many commercial fishing charters available for all fishing enthusiasts. We love the beach and the Southern Oregon coast. This area has the best weather conditions of anywhere on the coast. The summers days always have a nice cool breeze to get away from the heat of the inland areas. The winter storms are great to watch from a nice warm viewing room. Beach Combing, hiking, mountain and road bike riding, fishing in the Chetco River and ocean, golfing, sailing, relaxing in the ocean air. High Speed internet wireless is available in unit. With prior approval of owner. Roomy condo with great views of the beach. Well equipped. We had a relaxing stay. Condo property is quiet, has a garage, easy access to Brookings, and gated. We would stay here again. Only downside is some road noise. It is all about the view!! My favorite spot was in front of the picture window in the unit with direct view of ocean, beach and rocks... never get tired of them. In addition, Brookings’ weather were perfect, always in 60s in August. The best weather for hiking/walking. We enjoyed all the trails which took us to most beautiful places near by. (Recommend to visit Harris state park camping ground and pick up hiking trail maps). Restaurants in town are within 10 minutes drive and offer great food. Chuck was always a text away, provided prompt responses to all our questions. One note - This unit is in ‘A’ building which is closest to Hwy 101 which can be a little noisy. Also it is on first floor next to the beach trail, so less privacy. However, it provided easy in and out access to the parking. Overall, we enjoyed our stay and will miss all the breathtaking places we visited while staying at Brookings. Positioned. Around the room made it easy to get around. Our favorite spot was the swivel rockers positioned in front of the large picture window in the alcove. CHUCK the owner is an exceptional host and ready to answer any questions and makes sure that any minor problem is quickly corrected. He spent one morning showing us where everything was and how the appliances worked. All of the Condo people were very helpful. You are only 2+miles from shopping and some great restaurants. Rock Cave is beautiful but the path down to the beach is very steep. 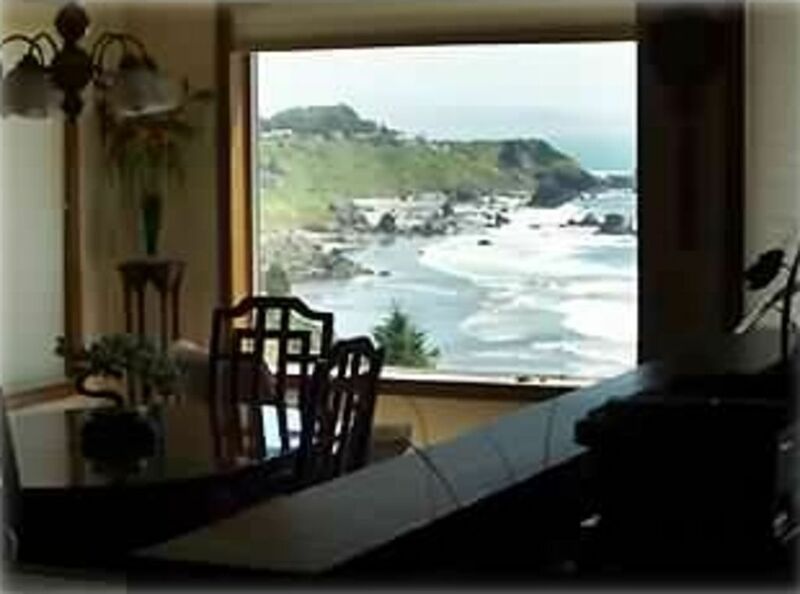 This is an ideal place for couple that wants to layback and enjoy the Oregon Coast. We highly recommend this Rainbow rock condo with beautiful scenic views of the rocky coast. It's spacious and nicely decorated with comfortable furniture and a very comfortable king bed. It's impeccably clean and has everything we needed. For our 50th anniversary we explored the Oregon coast from Astoria to Brookings with our longest stay here. What a great choice as Brookings is our favorite spot on the coast with some of the most scenic walkable beaches and a beautiful redwood forest trail and more. While a bit challenging at the end of the trail, we took the private path from our condo to the beach at low tide to explore the magnificent rainbow rock with cave. We enjoyed local eateries including Vista Pub, Panchos and Mattie's Pancake House. There are many other choices too but these were reasonable and delicious. We highly recommend this Rainbow Rock condo and the town of Brookings for a spectacular vacation spot. Antiques, beach combing, ccean and river fishing, beach hiking, bicycling, Ocean Kayaking and many more things to do and lots of great restaurants. Standard Rates are year round. Monthly rates are considered long term rental ask for off season monthly rates. Monthly Rates not available during peak season (June, July and August) Credit Card payment available.